It’s been a difficult fortnight. From the murder of Jo Cox MP, someone I didn’t know personally but had worked with a huge number of my friends and was a tireless champion for many of the causes that matter to me, to the Brexit vote and the ongoing political fallout from it, it’s hard to identify a more difficult couple of weeks in my professional career. Judging from the news from the last 24 hours it’s not ending yet, but here are a few initial thoughts for campaigners – I suspect these will change in the coming days and weeks! 1. Be intentional about focusing on self care – I sent this to many people I worked with on Friday. We’re in turbulent times and they’ll require us to organise, but we can’t do that without looking after ourselves. We really do need to be in this for the long-run. This is also really good on the topic. Getting together, taking time off from social media, building community are all things that matter more than ever before. 2. Get out of the city and into the country – Many have written eloquently about the implications of the divisions or splits between the parts of the country that voted for Remain and Leave. This polling from Lord Ashcroft is useful to get a sense of the difference in views on a range of issues. For all campaigners, if we want to grow support for our issues then we have to do that amoung enough groups to demonstrate their are political gains to be made from backing our issues – to do that will mean getting outside of the big cities. Failure to do so and there is a risk that the issues that we’re campaigning on are seen in the same way that the Remain campaign was, as part of the elite establishment. At times like this I can’t help but think of the example of Shelter who deliberately sent there teams out and about to marginal seats to test their key messages for their 2015 election housing campaign, or Invisible Children who while found success Kony 2012 but honed their message from years and years of presentations to groups of young people. Both are examples of campaigns that got the need to understand the way to build support is to get out and understand the public they’re looking to support their campaign. 3. Talk to people – On Wednesday evening I heard from academic Josh Kalla talk about research he’s done with community organisers in LA to prove its possible to change minds on transgender people through deep canvassing – they’ve found that from persuasion conversations you actually can change the minds of people. But deep canvassing not only requires time and people but also listening and sharing personal stories – all resources that require investing in and are perhaps in short supply. One of my criticisms of the Stronger In campaign was its apparent obsession with high-visibility campaigning like street stalls and leafleting outside stations. While they might have been a necessity given the resources they had, it never felt like a strategy for connecting people with personal reasons to vote Remain. 4. 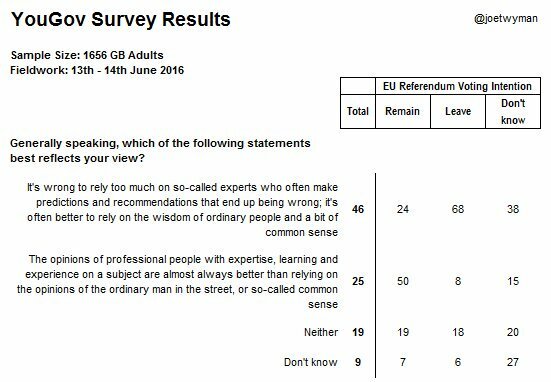 Recognise that expert voices don’t cut through to all – The Stronger In campaign has spent most of the campaign telling us how many experts were for Remain. I’m sure that was backed up and informed by polling, but as the polling below shows for a myriad of reasons many people don’t trust ‘experts’ any more. It means we need to think again about our messengers as well as our messages. 5. Bring our issues together – Our campaigning can sometimes pit one issue against another, but in wake of the referendum we need to explore how our campaigning issues are connected together and actively finding common cause. It’s a strong finding that comes out the Networked Change report (which I need to write more about) that those networks that are more successful are ones which cross movement boundaries – we need to find ways to connect issues together. 6. We are the leaders we’ve been waiting for – In the coming weeks and months we’ll need to organise ourselves with plans and strategies that respond to the situation we find ourselves in. Sometimes I live in the belief that others will be the leaders to help navigate a path forward, but if you’re reading this its down to you, me and other campaigners to explore solutions that allow us to do that. 7. We have #MoreInCommon – On Wednesday afternoon I stood with 5,000+ others in Trafalgar Square to say that we have #MoreInCommon to celebrate the life of Jo Cox. The event, which was one of 20+ around the world, was organised in just 5 days by friends and colleagues of Jo Cox. None of those friends wanted to be organising the event in such circumstances, but the way they went about wanting to celebrate the life was inspiring, helping to ensure the message from Jo Cox’s maiden speech that ‘We are far more united and have far more in common than that which divides us’ was shared. It’s a message to hold onto in all of the current uncertainty. Thank you Tom- very helpful comments and Info from a Brit in Zimbabwe trying to follow from miles away! Jean Webster ZOE ! This is really great, Tom and makes me want to join you on the thoughtful campaigning frontline. Couldn’t agree more about taking some time out from social media and looking after ourselves being connected!